This week we tapped two new beers in the IPA category: Lone Pint Zythophile Vic Secret and a Stone/Beavertown/Garage Project collab called "Fruitallica." The Lone Pint Vic Secret is part of their Zythophile IPA series in which they use a single experimental hop to brew the beer. In this case, Australian Vic Secret hops are being used. From the Lone Pint tasting notes: "Appearance is hazy orange with a solid white head. Nose is light bready malt with a complex mix of pine, lemon grass, pineapple, and guava. Tastes initially of light malt sweetness and grapefruit; this is then followed by an equally complex flavor profile with hints of lemon guava, and basil." It's a 6.7% ABV IPA. 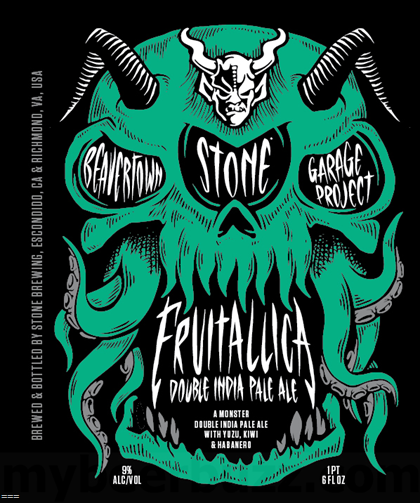 The Fruitallica, on the other hand, is a Double IPA from Stone Brewing (California), Beavertown (UK), and Garage Project (New Zealand). And check this out - the beer was brewed with kiwi, uzu and habanero. "Who knew kiwi fruit could be so metal," the folks at Stone say. "Add in a colossal hop character to ride the lightning of the subtle but fiery heat. Hops, fruit, heat... And Juiciness for all." It's an 8% ABV Double IPA.